Happy last weekend before Christmas! We are getting to that part of the season where I just want to stop and enjoy everything. Whether your house is fully decked out, or you are still pulling ornaments out of the boxes – this simple and stunning woven yarn wreath is waiting to top it all off like a bow. So you can sit and exhale a little. 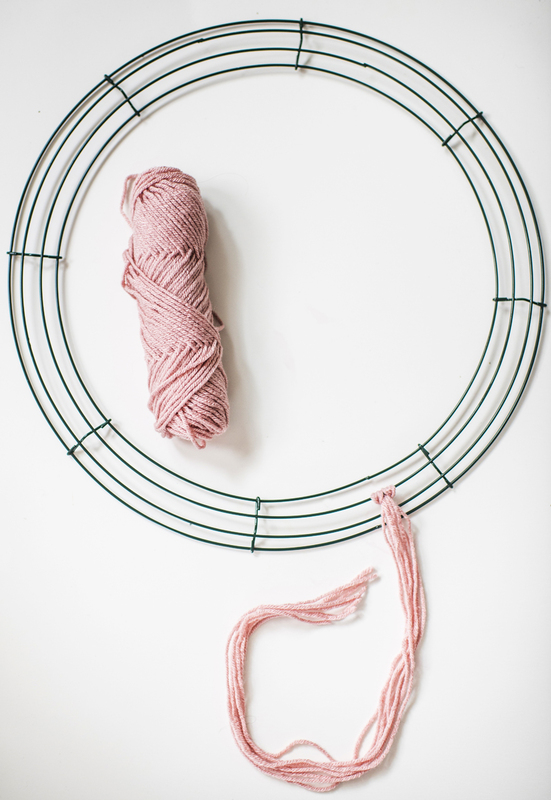 The yarn wreath is simple to make and is a great option for an afternoon of crafting while sitting by the fire on Saturday. 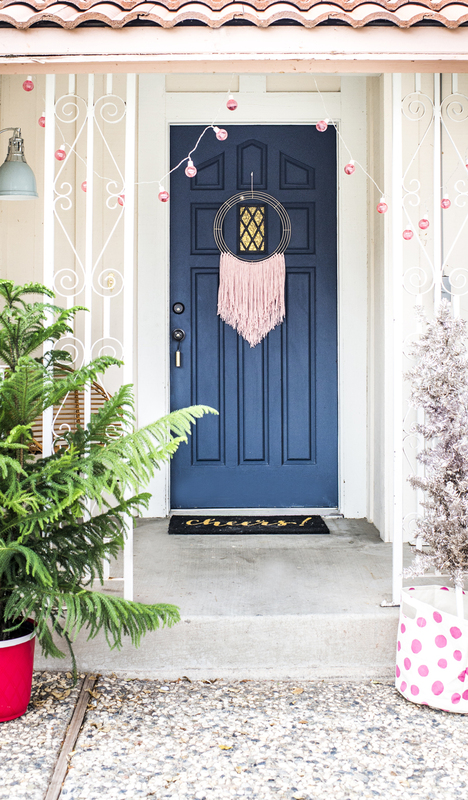 We made ours in light pink, which is a pretty choice for a darker front door, but the wreath could be reimagined in any color of the rainbow. Make one for your own door and make one for that last minute gift you are still trying to figure out. I love how the simplicity of this yarn wreath style beacons a festive holiday, but is still a totally appropriate wreath to leave up well into the new year, in fact it would even make a gorgeous Easter yarn wreath. I even used it in our new bathroom after I switched out the front door. This beauty might just become my year around welcoming committee. 1. Spray wreath in your desired color. We used gold. Let dry. 2. Cut almost a whole skein of yarn into 4′ pieces. 3. 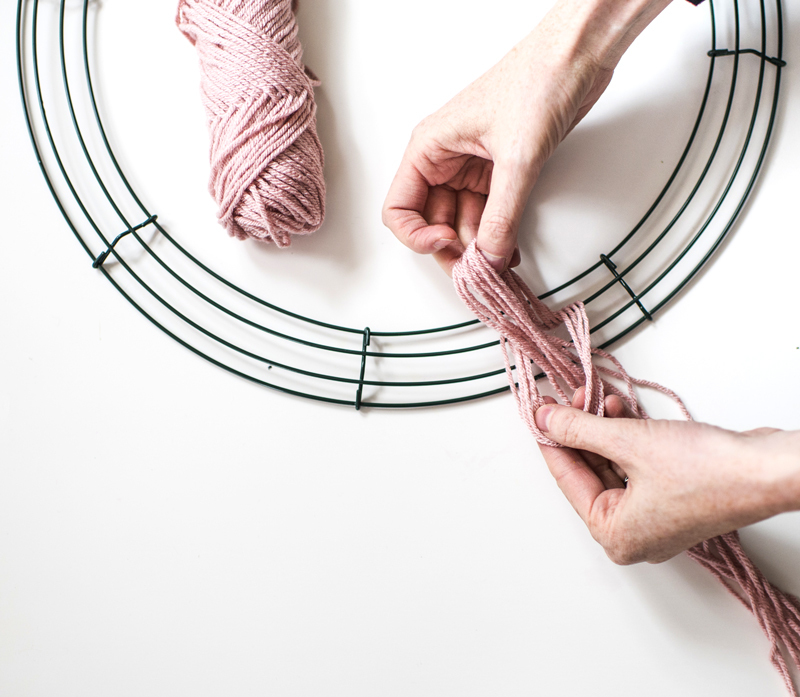 Taking 3 strands, fold in half and loop around the frame, pulling the ends through the loop to make a knot. 4. Continue along the wire wreath until it’s filled to your liking. We filling ours about 1/3 around for a modern look. 5. Repeat for two more layers along the wreath. 6. Cut the ends so that all the lengths are even. We cut ours in a chevron using a ruler as a guide. 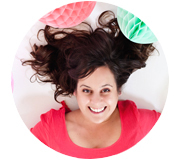 The back most layer is the longest, with each layer above cut 2 inches shorter than the last. Once the yarn wreath is fully wrapped all that is needed is to hang and enjoy! 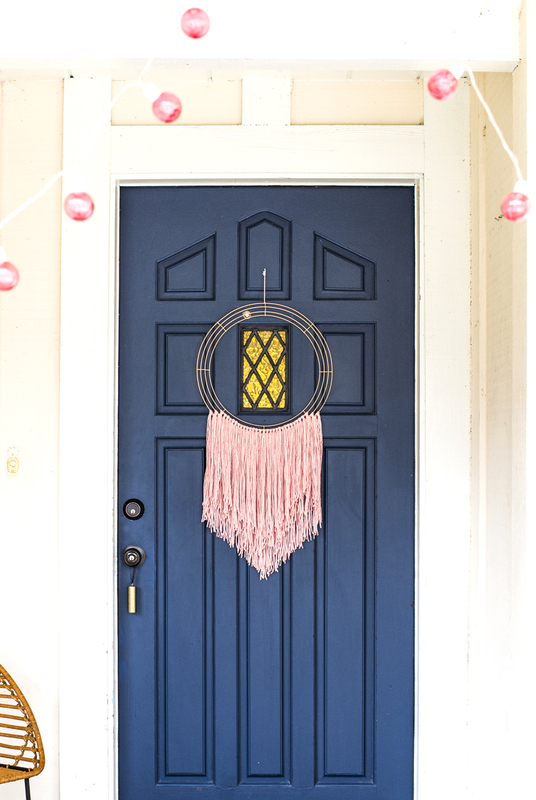 I’m loving this simple and pretty front door statement. PS. 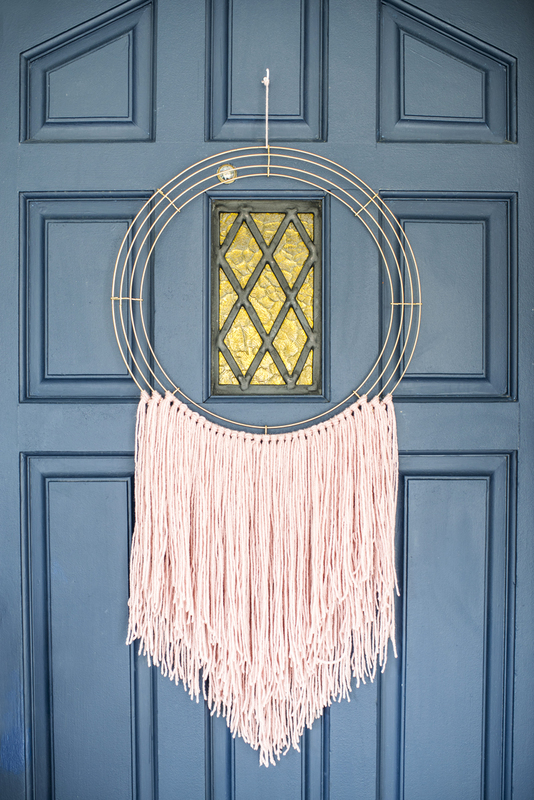 A pompom wreath, a paper wreath and a wreath made of the prettiest lights around. (Photography @A Subtle Revelry by Ali Denney). I may try this. I might actually be able to do it!! So simple but so cool!